A quiet Sunday afternoon at the Akhtar household yesterday, with me reading Maurice Tillieux's 10,000 Years in Hell on one sofa, while my nephews (respective ages 7 and 5) watched Planet Hulk on another. A notable day if only for it being the occasion on which they became aware of the existence of Beta Ray Bill. 'Beta. Ray. Bill.' breathed the older one as if familiarising himself with a rosary prayer. But there was no less excitement on the other end of the room. I've been waiting for this book to come out for a long time and it was worth the wait. You know when something is so good you sit there squirming in delight, revelling in each moment? Your shoulders go up, your neck goes in, sometimes there's little indiscernible noises of pleasure. There was definite twitching. Part of that appreciation is cognitive: things you're exposed to, and enjoy, during formative periods in your life have a long-lasting impact on the evolution of your taste. 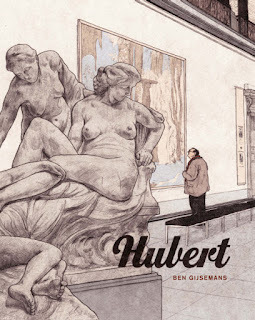 I loved detective/adventure/mystery stories when I was a kid: Tintin, The Hardy Boys, The Famous Five, etc., and crime remains the fulcrum of my prose reading today. 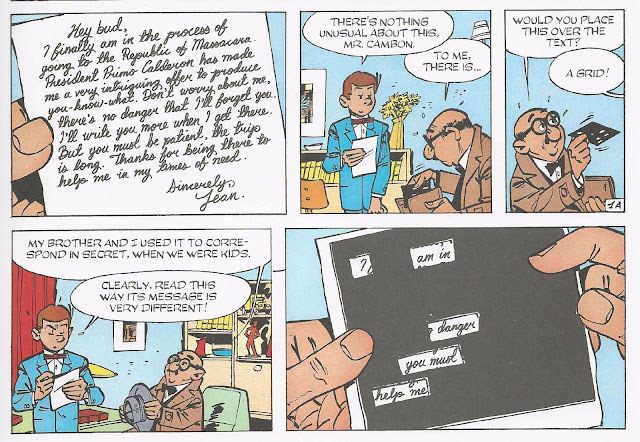 I'm pretty sure my preferences of certain shades can be traced back to Herge's colour palette. I'd like to think I'd be as open to ligne claire and atomic style bande dessinees if I hadn't read Tintin and Asterix but who knows. Art is a language and parsing what you're not used to can be a difficult process. Tillieux's Gil Jordan often gets tagged with the 'grown up Tintin' label, but Tintin -age *14* lest we forget, owner of an impenetrable skull, piloter of planes, boats, and submarines, master of firearms- is obviously a superhero. 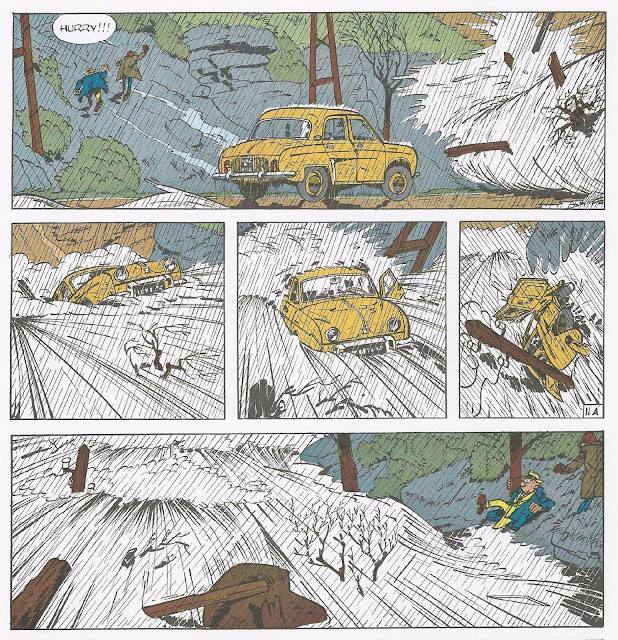 The similarities lie in the sharing of (apparent) genre, the fact that both our heroes are ginger, and superficial allusions to the 'look' of the art/ However, Tillieux's 'atomic' style is an advancement of Herge's more classic clear lines. There's more brushwork, more texture. Lines are allowed to be looser, sketchier. Shapes have body. It has sinew, it's alive. Straightaway, on page 1, there's a mysterious letter complete with secret coding device (known only to the recipient) used to uncover a hidden message. Page 1! I get such a kick out of these things. There are 2 stories in this volume: 10,000 Years In Hell, about an inventor who gets kidnapped by the government of a small South American country for his weapon designs, and Boom and Bust which sees a retired colonel as the target of an increasingly threatening letter campaign. On the one hand, Tillieux's stories are straightforward with little twists or surprises. But narrative is more than plot. Narrative is everything. In comics, narrative is lines, layout, expressions, colours, ideas, scenes, emotions- everything that has the ability to convey something. And make no mistake, Tillieux is a master of all these. Take the above scene. It could easily be a few panels of Tony in the booth talking on the phone, possibly interspersed with panels of the person on the other end. Instead Tillieux gives us that much more: a panel of the bar, the arcade game, men drinking, building atmosphere. 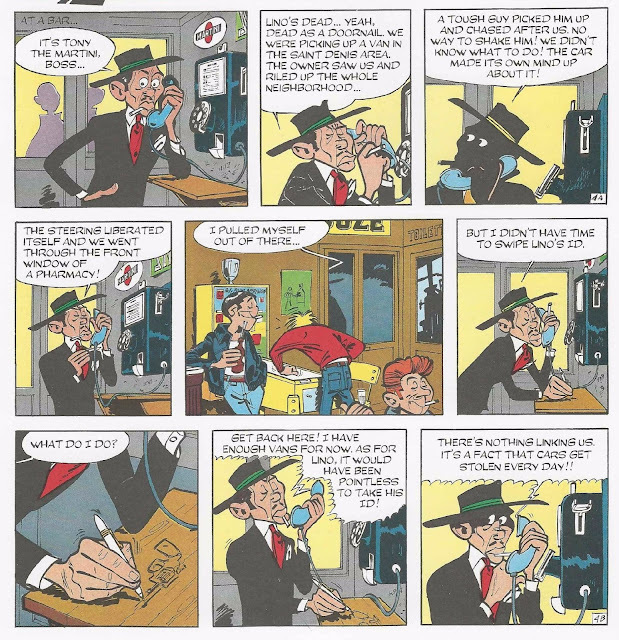 And in choosing to stay on Tony, he adds tiny bits of characterisation: Tony's free hand does 3 different things in this sequence, neatly folding itself in a pocket, smoking a cigarette, and doodling a gun while chatting. Here's another simple yet effective device. 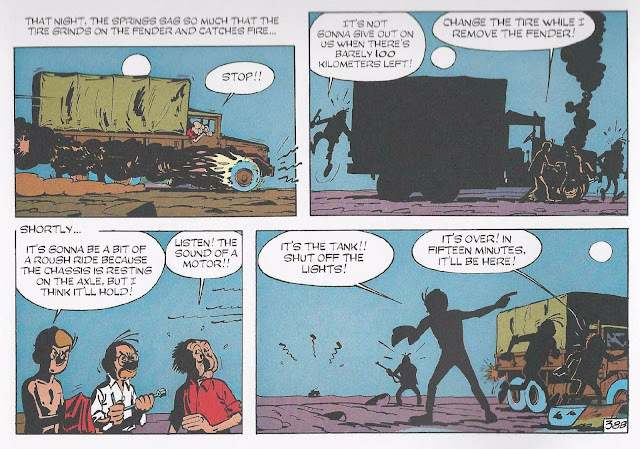 A regular-sized panel shows Gil and Crackerjack hitting the road. Next to it, Tillieux places 4 small, split panels of town signs, equal to the size of the first, to show the progression of their journey. This literally drives the action forward, allowing him to move both his characters physically from place to place and also move on to the next bit in the story. The stories in this book are much more lighter, with increased humour than those in Murder By High Tide, which were slightly grittier, leaning to noir. There's some nice realism, still, such as when Gil gets caught in the rain and his hair stays messy and sticking up for a number of pages. Or the sheer labour of the prison escape in trying to drive a van through desert: stopping, starting, digging sand, moving forward inch by inch. I like little touches such as the appearance of this chemist, who's just had a truck careen into his shop. These panels are taken from the top and bottom of the same page. Tillieux has him return in the crowd scene to carry the joke through. The colouring is sublime. It never looks wrong or off, but upon examination, the choices are unexpected, lacking traditional symbiosis. Look at the colouring in this panel. It is nighttime. The only light is the inspector's torch. The orange of its beam is overlaid with the existing colours in the scene: a black tyre becomes green, a blue box is more yellowish. Walls are grey and purple. There's 3 different shades of blue in it. Yet there's something so pleasing about it. It delights me. I really liked the brushwork on this truck. To me, Tillieux's work is distinguished by his mark-making.